Advanced Homeopathy offered by Dr. Anish Vaknalli offers promising results in the treatment and cure of vitiligo with homeopathic medicines. For treatment and cure of vitiligo in children and adults homeopathic medicines should be started as soon as possible. Vitiligo prevention and cure without any side effects is possible only with homeopathic medicines. Photo: Vitiligo or leucoderma in a child from Barbados. This child from Barbados had multiple vitiligo (leucoderma) or white spots all over the face as an infant. Cases of Vitiligo are rare in Barbados. Physicians there generally prescribe multivitamins, local applications and recommend exposure to sun as a general trend which may help but not cure Vitiligo. Vitiligo affects people of all races equally but is more noticeable in darker-skinned individuals. 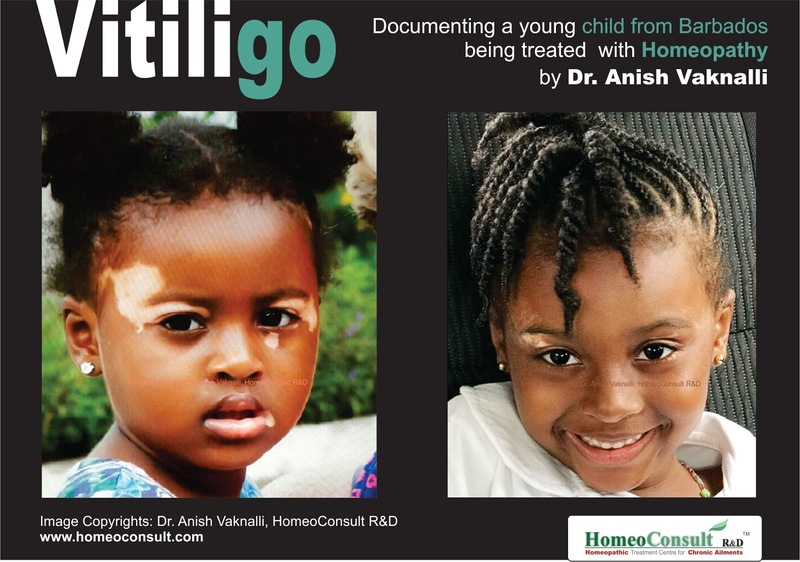 Advanced Homeopathic Treatment for Vitiligo by Dr. Anish Vaknalli has the ability to stop progression, reverse and cure Vitiligo in a large number of cases. Her treatment resulted in reversing over 90% of the spots and is currently left with only one white spot on her right eyelid. Advanced Homeopathy involves homeopathic medicines based on the constitution of the individual and is a customized prescription. Homeopathic Medicines vary case to case thus yielding better results. Vitiligo is a skin pigmentation disorder causing white spots or patches of skin on different parts of the body. Vitiligo affects people of all races equally. It affects infants, children and adults and can be wide spread or affect a particular part of the body. Melanocytes or skin-pigment cells present in the skin are usually affected; however the mucous membrane and the retina may also show signs of loss of this pigment. Advanced Homeopathy prescribed here at HomeoConsult RD can be used in conjunction with the medicines you are already taking or can also be your only choice of treatment for Vitiligo. Never thought Homeopathic treatment can bring about such a change. I am a dermatologist and truly inspired by these results. Do give full credit to the Dr treating her and give full marks to his experience and knowledge. Good job!